A ready website template is the best solution to launch a website within a short time. The predefined structure of a ready-made template contains relevant sections. So, if you can discover the appropriate one, you need to modify only the text and visual elements. But, it’s a challenge to detect a suitable template if you don’t have prior knowledge about web technologies. 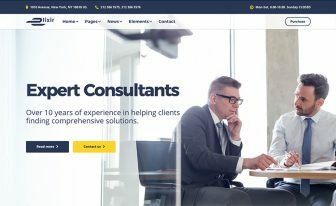 Keeping that in my mind, I’ve listed 30 business website design templates in this post for you to reduce your stresses and hassles. What type of website you’re building? 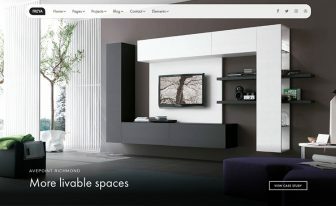 : I’ve assumed that you are looking for a business website template. That’s why this list contains only those which satisfies the business purposes. HQ visual qaulity: All templates include high quality retina ready functionality. So, you have a chance to decorate your site with the high-quality graphic elements. Responsive (i.e. fits on every device): Following each template based on Bootstrap grid system and so they fit perfectly on every device. You can check that either on Google Mobile-friendly Test Tool or Am I responsive Site. SEO friendly: You must apply SEO techniques to your site as well as an SEO friendly template to rank up your page. This post holds only SEO friendly templates. Flexible and easily customizable: Don’t worry, I’ve listed only those templates which are easily customizable. Crafted by trusted developers: Here, 30 templates are crafted by professional developers who are working directly or jointly with the renowned organizations. Cross Browser Supported: Imagine, you have an outstanding website prepared by a template. But, it does not support in the old browser. Then, what will be the feelings of you! It’s pathetic. Don’t worry! Here all of are cross browser compatible. 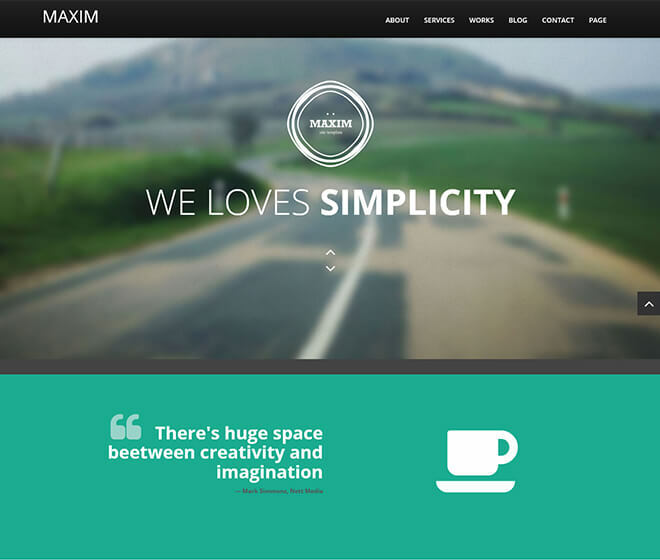 Maxim is a flat, modern, young, and stylish bootstrap one page business site template. Suitable for freelancer, agency, corporate, creative people to showcase their profile or works. It’s built with the latest technologies like Bootstrap front-end framework, prettyPhoto, font-awesome, flex-Slider, and so on. It has the most recent trendy style and is coming with many attractive features. Template color separated in a single CSS file, so it’s easy to customize or change template color! Bootstrap 3, jQuery Plugins, animate.css, Flex-slider, PrettiPhoto, Font-Awesome . Flat, Modern and Young Design. MyBiz is a clean and elegant free HTML5 Bootstrap template that is suitable especially for the business websites. But this template will help you to make any website like agency, corporate, professional, financial, agency or other business. It is a free template. The pro version of MyBiz comes with fully working Ajax/PHP contact form. Bootstrap 3, Font-awesome, Flex-slider, jQuery Plugins. 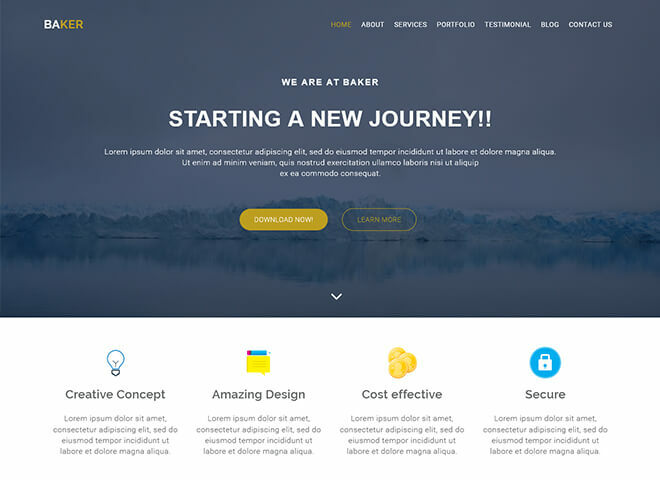 Baker is a neat and clean, creative, multipurpose free Bootstrap HTML5 business template designed for professionals. Suitable for business, corporate, portfolio, blog and any professional website. The Bootstrap frontend framework powers Baker. Anyone can easily customize this. Lots of amazing features like Flexibility, a bunch of components with endless Color combinations, full-screen Image Sliders, parallax effect, Google web fonts and much more are available. It is well crafted, contains beautiful and unique concepts with well-documented code. Bootstrap 3, jQuery Plugins, Wow.js, Bx-slider, Font-awesome, animate.css. Bootstrap 3, jQuery Plugins, Font-Awesome, animate.css, Google Web fonts. 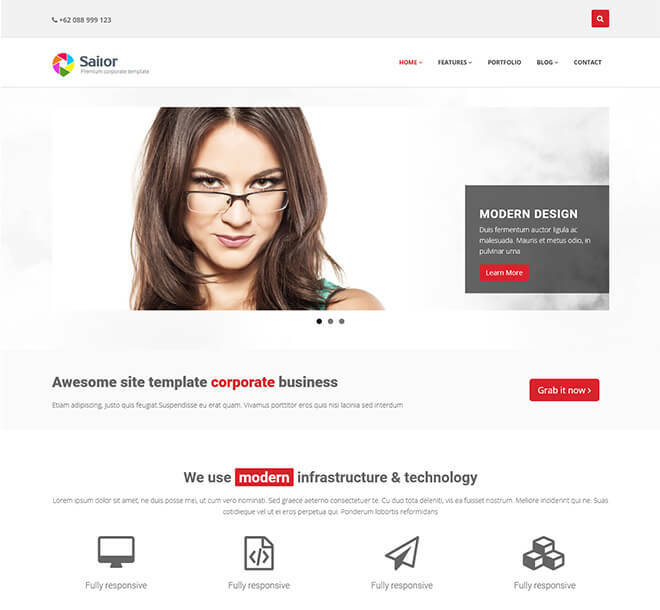 Sailor is a responsive HTML5 site template for corporate business. Perfect for many types websites like agency, corporate business, portfolio, product showcase, etc. 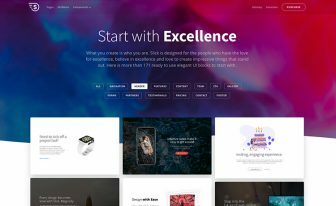 This template built with the latest Bootstrap framework and combined with ten pre-defined color combinations, ten different pattern backgrounds, WOW animation effects, and much more. Please check special features and live preview below. Bootstrap, jQuery Plugins, animate.css, Cubeportfolio, steller.js, Modernizr. 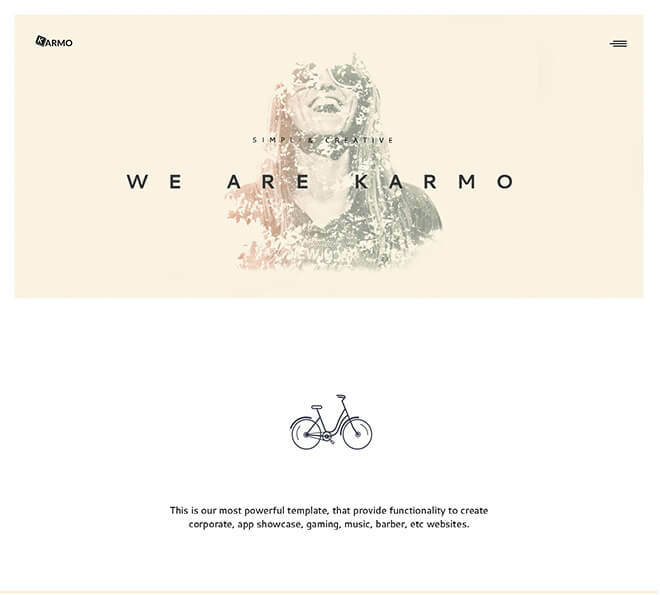 Karmo is a modern, flexible, well crafted and free HTML template. This awesome template designed and coded by the young UI/UX designer Tansilav Robert. It is based on Bootstrap front-end framework and consists of 4 pages, well-commented code and a set of components. It’s unique, clean and professional design concept makes it ideal for digital agencies and creatives of any kind. Bootstrap 3, jQuery Plugins, Owl-carousel, animate.css, Modernizr, Isotop, Smoth Scroll. 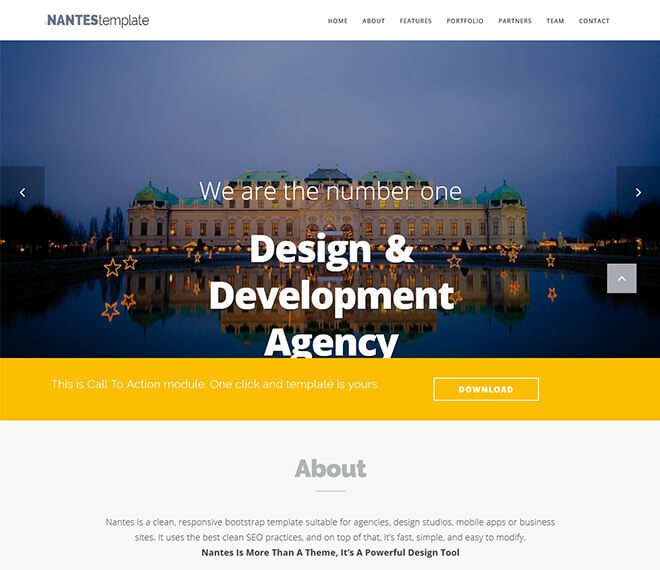 Nantes Bootstrap template is a lightweight solution for business, corporate, agency, or even personal. It is an elegant and modern template packed with “home, about, features, portfolio, partners, team and contact” section with the owl-carousel slider. The responsive layouts of this template work wonder in all screen resolution. Nantes is extremely developer friendly and easily modifiable, with an extensively commented coding. It incorporates all the powerful HTML5, CSS3, Bootstrap, and jQuery plugins to allow web developers to generate smooth and seamless one page multipurpose websites. Bootstrap 3, jQuery Plugins, Owl-Carousel, Animate.css. Navigator – free one page business template comes with all visitor loving components . Crafted with popular Bootstrap 3 framework for device friendly frontend allowing scalability for each screen. 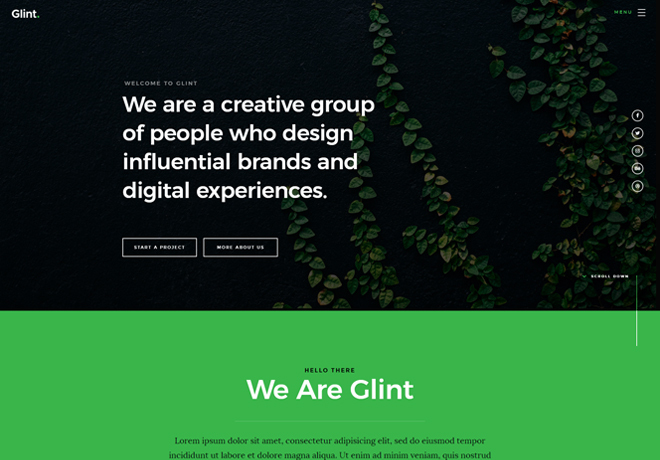 The color is perfectly suited superbly for any category website. Well-commented developer friendly codebase allows a developer to work on programming languages that can make this template conversion from static to dynamic easily. It’s successfully passed W3C validation, optimized for SEO, and compatible with all major modern browsers. Bootstrap, Font-Awesome, Owl-carousel, jQuery Plugins, Animate.css, Google Map API, Modernizr. Fame – Free HTML Website Template is the perfect example of professionalism that combined with fantastic design. To allow you the asperity of ultimate style, Fame includes an extraordinary slider, musical skill showcase, pricing chart, project analytics, about us section, team section, Blog area, service, client testimonial, and glossy footer with easy navigation. It’s crafted for the famous and elegant sites. The codebase is well-organized, comes with error free W3C valid markups. 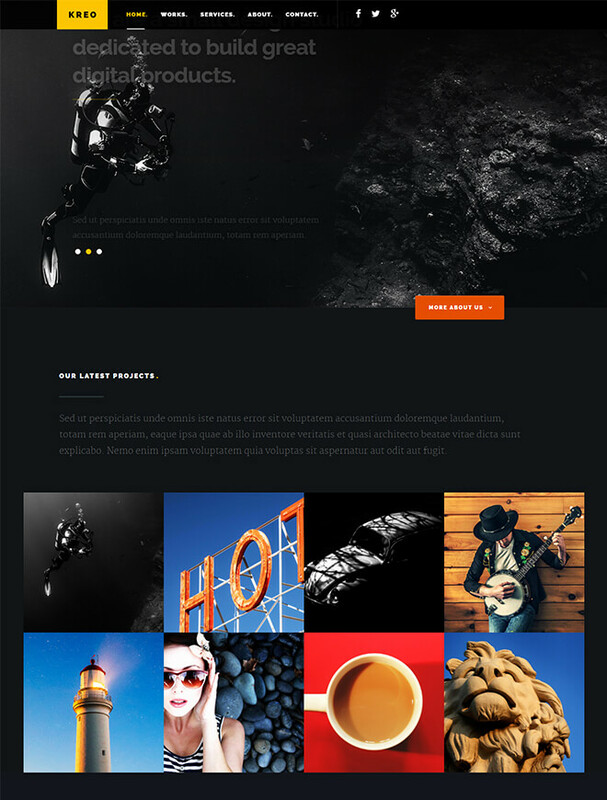 Perfect template for the websites of business, corporate, marketing agencies, IT firms, landing, creative or personal portfolio, resume, freelancers, photographers, graphic designers, artist, affiliate marketer, and other websites. Bootstrap, Font-Awesome, Owl-carousel, jQuery Plugins, Animate.css, Modernizr. Sulfur is a free simple HTML template, carefully crafted for corporate, business, IT firm, and amazingly more. It comes with automatic compatibility with various viewing screen widths and mobile devices with retina ready support. The code is well-documented and well-organized. Scripts contain W3C valid markups. Cross browser compatibility of IE9+, Firefox, Safari, Opera, and Chrome. The User interface is engaging, and UX is well-researched. This lightweight, fast loading, and simple HTML template come with all essential features that make it extraordinary and outstanding in the crowd. Brandi, the free responsive one page bootstrap business template powered by Twitter Bootstrap. No need extra code, no additional feature, no any sections. It provides end users a dominant power to build any kind excellent website having ease in mind. This lightweight and fast loading template perfectly suited for business, corporate, agency, app showcase, blog, portfolio, resume, photography, and innovative platform. Brandi couples with impressive features that have the ability to make a website successful. Bootstrap, Font-Awesome, Owl-carousel, jQuery Plugins, Animate.css, Modernizr, Wow.js. Timer – is Bootstrap based HTML5 responsive multipage agency template built using HTML5/CSS3 features. Fit for creative companies, agencies, and freelancers which demand a professional way to cabinet their skills, projects, services, and sell their products. Timer offers a beautifully elegant and well-spaced template that supports the policies of design. This flexible template uses fresh and clean design and allows to change it looks to your liking in one click. It has been shipped with the useful pages that let you start a broad array of your business section on the fly. Bootstrap, Ion-Icons, Owl-carousel, jQuery Plugins, Animate.css, Modernizr, Wow.js. Bootstrap, Font-Awesome, Owl-carousel, jQuery Plugins, Animate.css, Modernizr, Wow.js, Grid.js. Themelight is a blazing fast, modern and cutting-edge responsive business one page website template, glutted with the fantastic UI and excellent professional features to run corporate firms seamlessly. Especially it allows craft site for companies, agencies, photography studios, IT firms, profit and non-profit, and governmental agencies. The design of this template is incredible which can impress visitors in the first visit. Themelight is responsive, crafted following mobile first approach so that the template can easily fit both wide screens and small mobile devices. The documentation of this template is broad enough that allows you to build responsive corporate websites within short times. It is saturated with vibrant typography and highly interactive CSS3 animations. Bootstrap, Font-Awesome, Owl-carousel, jQuery Plugins, Animate.css, Wow.js. Freightage is the best solution for your transportation business to boost profits and expand businesses via online. 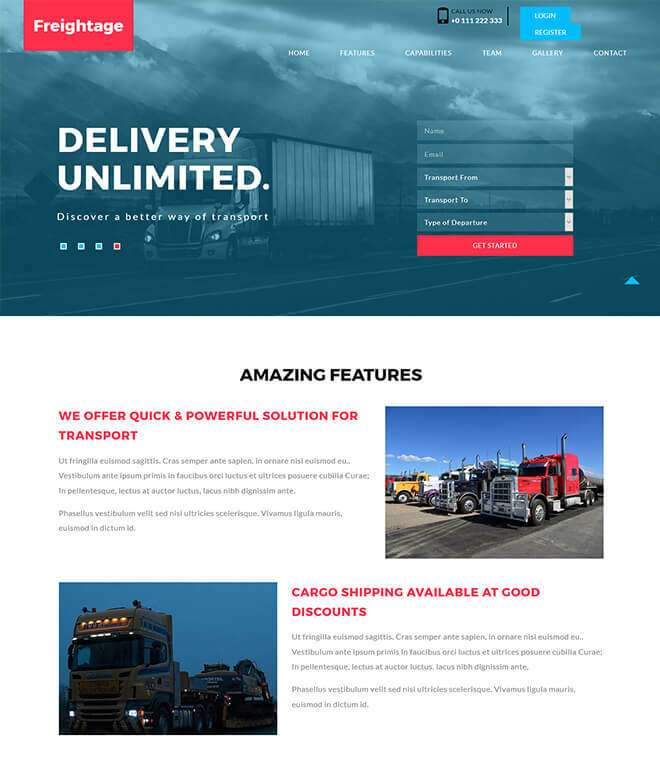 This template is also a perfect for the websites related to shipping companies, cargo delivery agencies, transportation companies, freight business, logistics, warehousing, food truckers, street vendors, courier, carrier, company’s cargo, air cargo services, trucking services, air transportation services, automotive dealership business and much more. 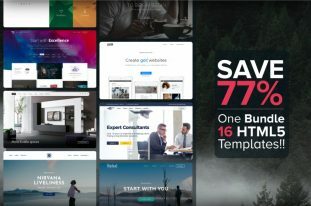 This unique and creatively designed template has transport related sections created in eye-catching style, mesmerizing parallax effects, smooth scrolling navigation, awesome hover effects, gallery lightbox, stupendous login and register forms, etc. It is entirely built on Bootstrap framework, HTML5, CSS3, and jQuery. Bootstrap 3, jQuery, Modernizr, Font-awesome, Google Fonts. Affluence is a business category Bootstrap responsive web template perfect choice for your business or any corporate websites. This latest and imaginative designed template can also be the best option for agency services, consultancy companies, accounting & financial services, training centers, landing pages, photographers, portfolios, studios, institutional and government websites, law firms, freelancers, IT firms, furniture companies, engineering or machinery businesses and much more. 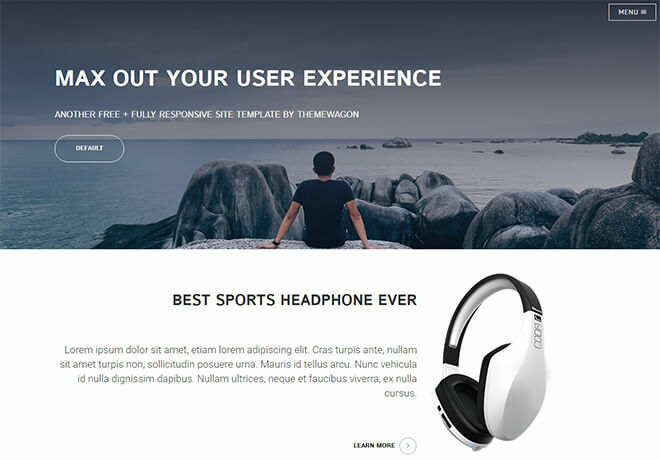 This elegantly designed ultra-modern template has formidable features like its eye-catching banner slider which slides from bottom to top, awesome menu button when clicked it opens a door and displays a clean, transparent menu, smooth scrolling navigation, zooming slider in about section, enticing hover effects, awesome sliding lightbox effect and much more. This template is 100% responsive, cross-browser template. It is purely built on Bootstrap framework, HTML5, CSS3, and jQuery. Bootstrap 3, Font-awesome, jQuery Plugins, Modernizr, Smoth Scroll. 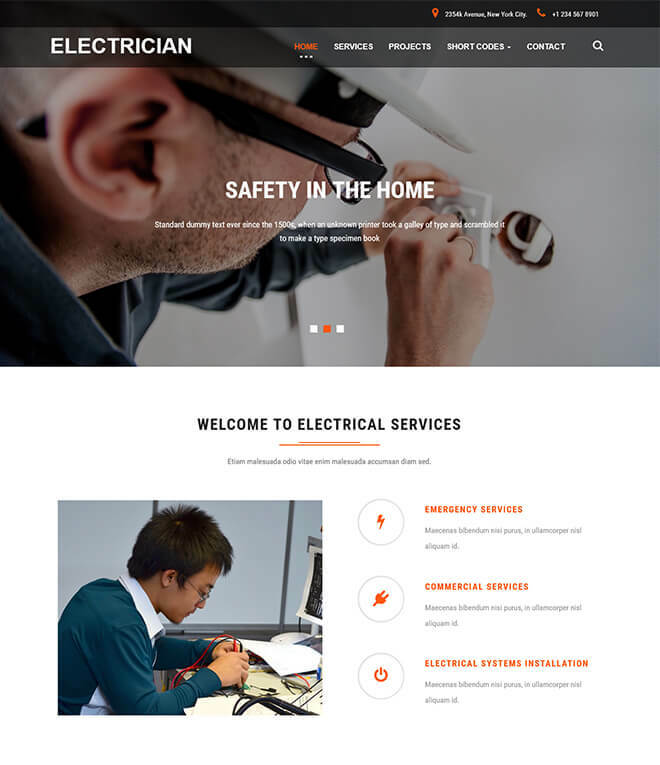 Electrician is a neat and clean, creative, Business free Bootstrap HTML5 business template specially designed for all industrial related websites. This smartly designed template is suitable for manufacturing industries, factories, plants, laboratory, construction companies, machines, metal products, automobile spare parts, furniture, electrical equipment, kitchen utensils & cutleries, drugs & chemical products, mobile phone accessories, and much more. The Bootstrap frontend framework powers Electrician. Anyone can easily customize this. Lots of amazing features like Flexibility, a bunch of components with endless color combinations, full-screen image sliders, Google web fonts and much more are available. It is well crafted, contains beautiful and unique concepts with well-documented code. Bootstrap 3, Font-awesome, jQuery Plugins, Modernizr, FlexSlider. Do you need a website template to create a modern website easily and quickly for any business, industrial, research, and manufacturing, engineering or machinery sales service with real content? Then here’s the solution. 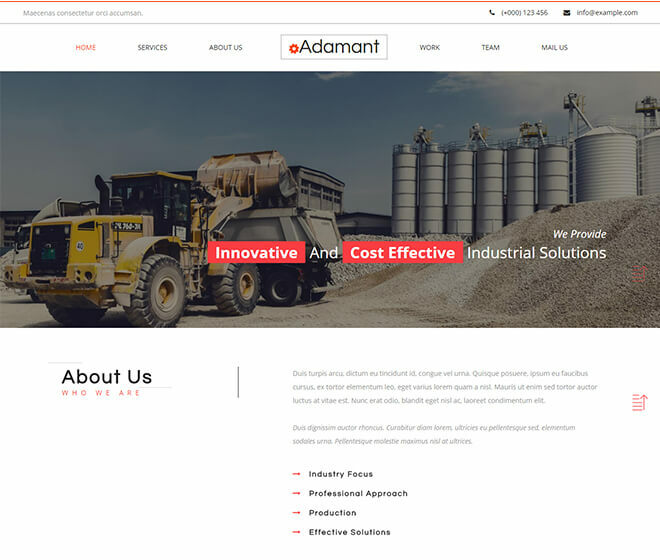 Adamant, a perfect template which satisfies the requirement of any business websites. It’s formed in the clean, flat, elegant, modern and intuitive way. It has 100% responsive layouts and is compatible with all devices. It is entirely built in Bootstrap Framework, HTML5, CSS3, and jQuery. Bootstrap 3, Font-awesome, jQuery Plugins, Google Fonts. 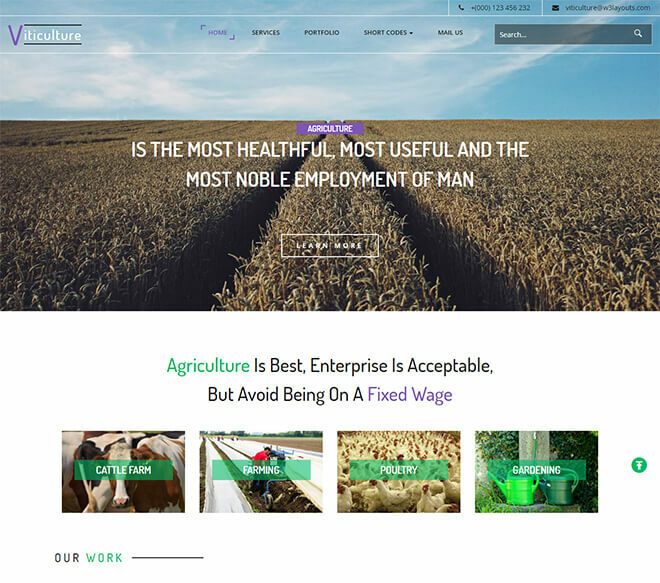 Are you looking for something new and unique for your next farming business websites? Then, Viticulture the free responsive one page bootstrap business template powered by Twitter Bootstrap is the only one solution for you. No additional feature, no more code, no more hassles which provide end users a dominant power to build any kind excellent website having ease in mind. This lightweight and fast loading template perfectly suited for business, corporate, agency, app showcase, blog, portfolio, resume, photography, and innovative platform. Brandi couples with impressive features that have the ability to make a website successful. Bootstrap 3, Font-awesome, jQuery Plugins, Google Fonts, Flex Slider. Tenements is a clean, minimalistic, beautiful and responsive free Bootstrap template for modern web designers. It came with clean and flat style and fitted to you who like a minimal and modern design. 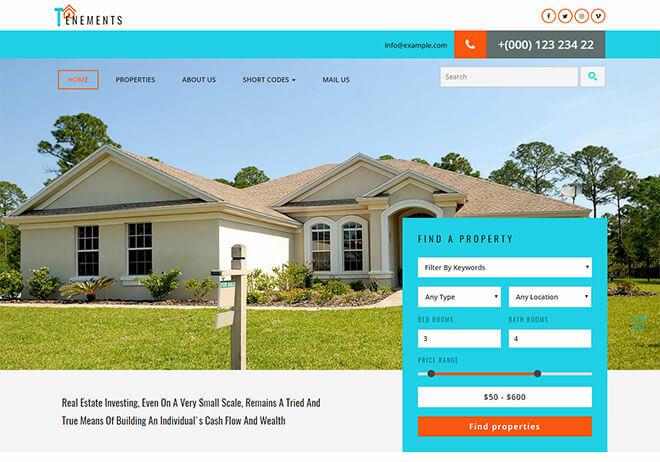 Perfect for real estate themed multipurpose websites. It’s an elegantly designed template which has pretty impressive features like beautifully crafted booking form, fabulously designed grids with images, mesmerizing hover effects, carousel sliding images, very clean, sleek and minimalistic style of design in every detail. It contains W3C valid HTML5 and CSS3, with jQuery technology. The layout of Tenements is powered by Bootstrap Framework that’s why it is fully responsive. 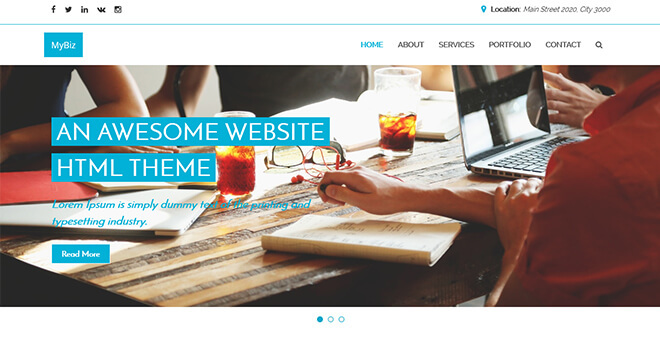 Wooster is the HTML version of Wooster theme developed by Graphberry. 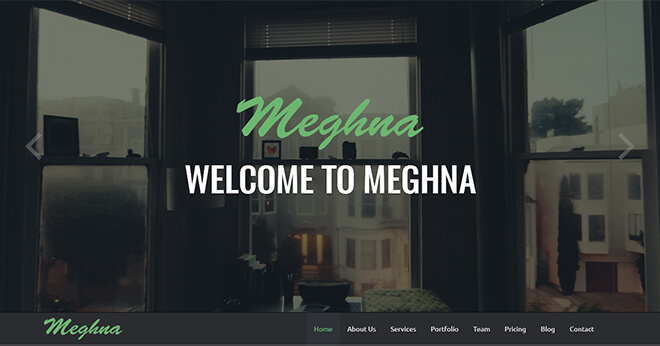 This is a free single page HTML5 CSS3 template based on Bootstrap frontend framework and a perfect example of professionalism that combined with fantastic design. To allow you the asperity of ultimate style, Wooster includes an excellent showcase, about us section, team section, blog area, client testimonial, contact, and glossy footer with social links. It’s crafted for the famous and elegant sites. The codebase is well-organized and written with error free W3C valid markups. 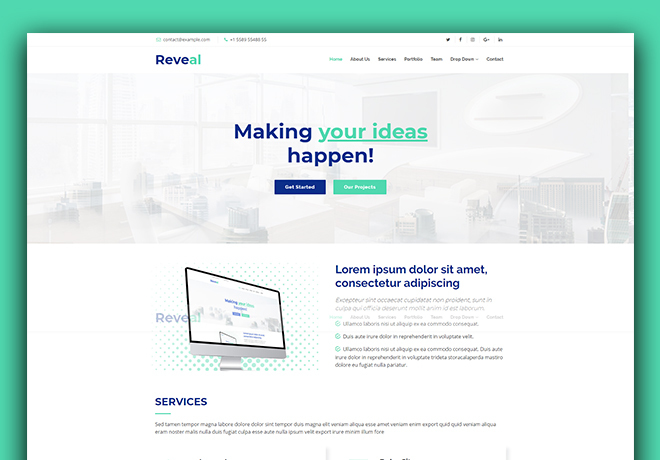 Perfect template for the websites of business, corporate, marketing agencies, IT firms, landing, creative or personal portfolio, resume, freelancers, photographers, graphic designers, artist, affiliate marketer, and other websites. Kasper is creative one page HTML5 template great for business, corporate, agency, any other web page. It is accurate for startups, freelancers, or even the larger companies who want to exhibit their skills in a professional style. Visitors from a handheld device will still be attracted to it’s minimalistic but user-friendly approach. Bootstrap 3, Font-awesome, jQuery Plugins, Google Fonts, Animate.css, Modernizr. 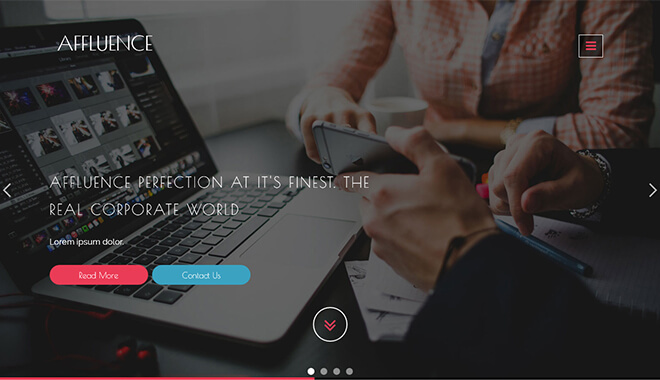 Urban – A sleek, modern and stylish responsive business site template for corporate business. Perfect for many types websites like agency, corporate business, portfolio, product showcase, etc. This template built with the latest Bootstrap framework and combined with striking color combinations. Please check special features and live preview below. Theory is just a crisp, modern landing page template ideal for businesses and corporations. This free multipage business template comes with all visitor loving components. It is crafted with Bootstrap 3 for device friendly frontend allowing scalability for each screen. Well-commented developer friendly codebase allows a developer to work on programming languages that can make this template conversion from static to dynamic easily. It’s successfully passed W3C validation, optimized for SEO, and compatible with all major modern browsers. Bootstrap 3, jQuery Plugins, Animate.css, Google Fonts. Boxify is a stylish HTML5 CSS3 Template that was carefully crafted and enhanced with some smooth effects. It’s built in the process that anyone can easily modify it fits on any portfolio or start-up website or many other projects. It contains W3C valid markups. The layout of Boxify is based on Bootstrap grid system that’s why it has the cutting-edge layout for every device. Bootstrap 3, Flickity, fancyBox, jQuery Plugins, Waypoints, Animate.css. Kreo is the perfect template for business, creative professionals, agencies, and freelancers. It can also be applied to small business websites. Based on Bootstrap 3 grid system. So, it has 100% responsive layouts. The template emphasizes a modern and bold design with subtle CSS3 animations and retina-ready display. It contains a working ajax form and is compatible with all modern browsers. 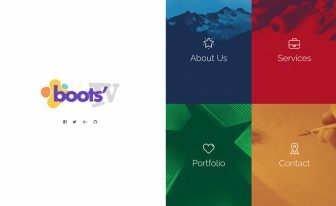 Bootstrap 3, Google Fonts, Font Awesome, Flexslider, Waypoints, jQuery Plugins, Animate.css, Modernizr. 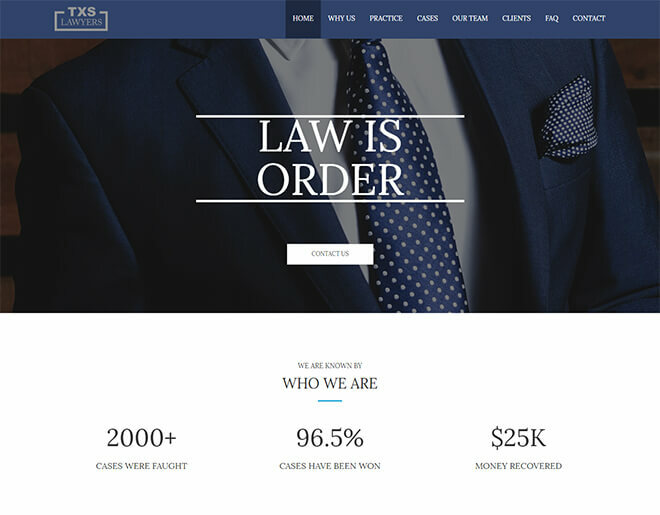 Texas Lawyer is a free lawyer attorney or law firm website template crafted with HTML5 & Bootstrap 3. Built for Legal Advisers, Legal Offices, Law Firms, Lawyers, Attorneys, Barristers at Law, Counsels, Solicitors, Advocates and other legal and law-related services. It is perfectly suitable for any legal affairs or consultancy website. The design is purpose oriented and comes with Free Consultation Form, practice areas, case results, frequently asked questions and team members page. 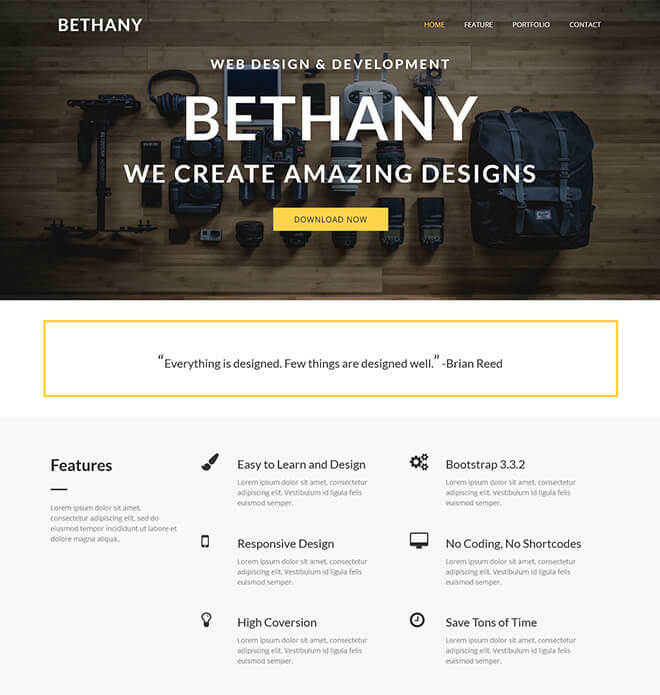 You can design a website with this template without any coding knowledge. 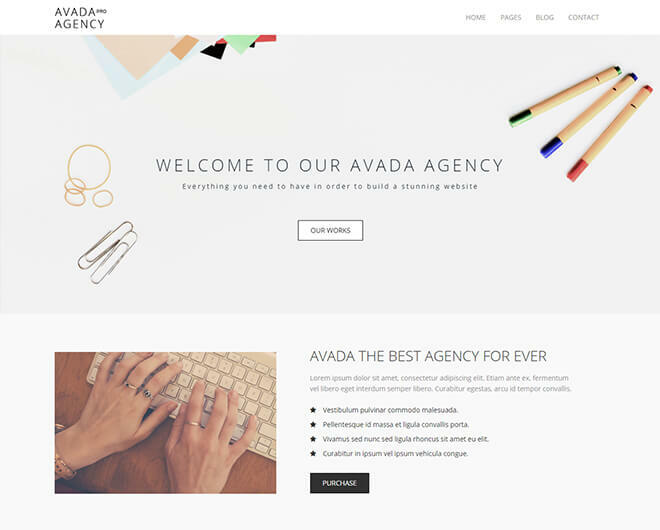 Nevada Pro Agency is a free business website design template especially for agency websites or corporate company websites such as small or medium organizations, travel agencies, consultant agencies, advertising agencies, real estate agencies media companies, and other agency websites. Relevant sections of a business website such as home, about, service, portfolio, gallery, blog, contact, 404, coming soon are included. Just says, it’s a business category website template. Solid State is a responsive business website design template. It’s available with high-quality graphics supports like retina ready display. It coupled with more than 100 pre-designed elements. The user can technically develop almost any types of website using this. 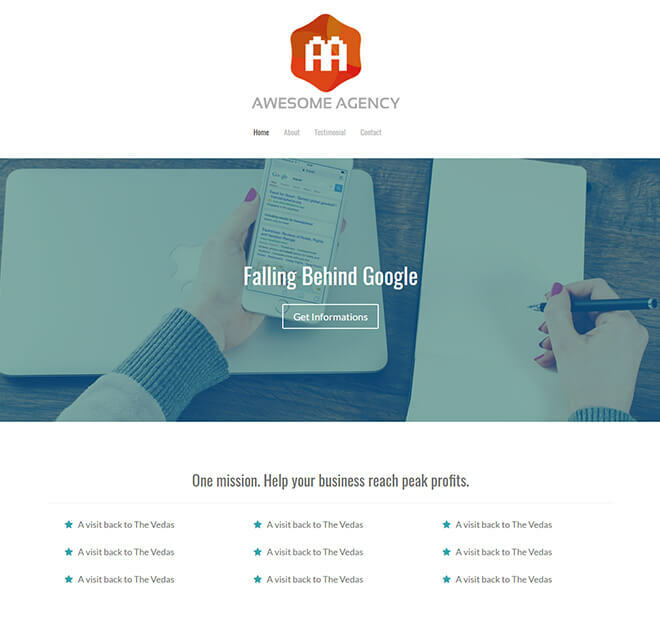 Agency is a great template for a new entrepreneur who is looking for a website template for his/her small business purpose. It combines with the latest Bootstrap framework, font awesome, HTML5, CSS3, and jQuery plugins. Agency is a free template both for personal and commercial use. 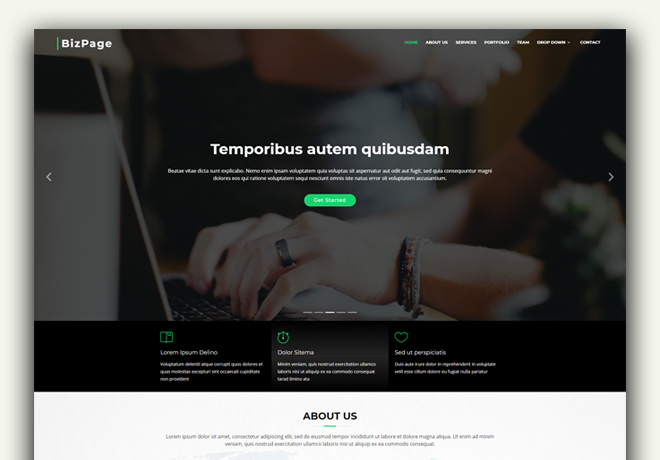 BizPage is a free business website template that harmonizes the trends of the millennium and an up to current tool. It comes into play when you need a support to build your next website for your agency, firm, and company. It’s mandatory for modern day websites to be accurately responsive and cross-browser compatible. Fortunately, BizPage is capable of doing that for you. When people are seeing the site from mobile devices, there comes an off-canvas navigation. Furthermore, the gallery has the lightbox support to make a portfolio. Carousel sliders, smooth scroll, parallax background, and active contact form – everything is in the line. 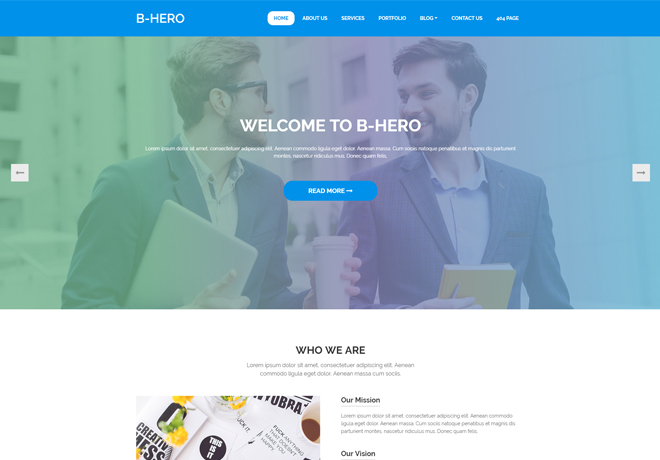 B-Hero is strenuously built free business website template for the professionals and creatives. A corporate website that tells the story of your ins and out is now easy to build if you take B-Hero. The features are countless, and useful too. As the parallax effect gives the template a visually astonishing look, also there are animated counters which are brilliant as well. Similarly, email subscription, pricing plan, testimonial slider, and filterable gallery are also accessible. Needless to mention that it’s a multipage template and you don’t need to face a hard time to develop a big website in no time. 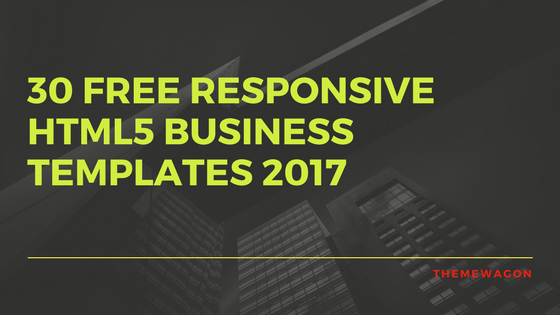 If you find a free business website template that’s responsive, well-ordered, and easy to unfold then you will surely get an unforgettable experience. To ameliorate your endurance Glint is ready to provide the necessary assistance. Sticky burger menu and hero header along with parallax effect made Glint to pick from the thousands of free HTML templates. And that’s not all this template holds. Working contact form and email subscription box are another two amazing option to turn the site interactive. 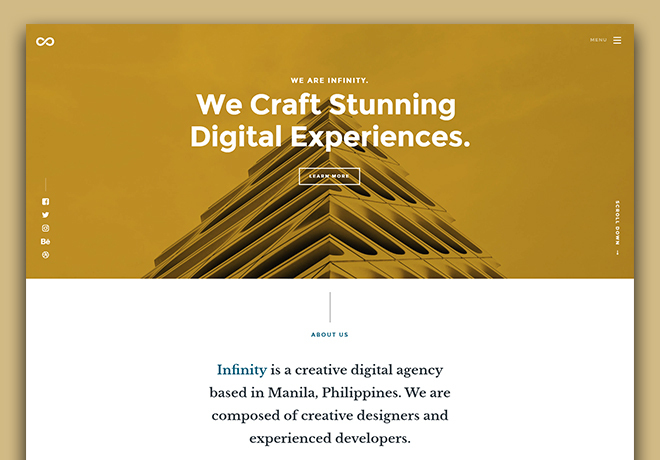 Infinity is a powerful, brilliant, effective, and magnificent free business website template. The colorful interface integrated with sticky header and other advanced features helped Infinity to get on the top of the line. Users will scroll and get fascinated by watching the smoothness of the action. If you unpack the file there are several wonderful options are waiting for you. From hover effects to flex slider, testimonial to working contact form, everything is right at your fingertip. Thank you Sandip. You’re always welcome to get our templates. Yes, Baker is awesome and the others are good, as well. You can find more free templates on our site.